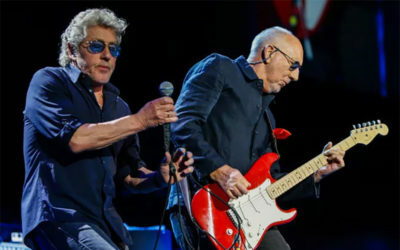 The Who announced an upcoming show at Wembley Stadium this summer on Monday morning (Jan. 28). Special guests Eddie Vedder (Pearl Jam) and English indie rockers Kaiser Chiefs will support. The iconic rock band is set to take the stage on July 6. A limited amount of presale tickets are available now through Jan. 29, and general tickets will be available for purchase on Feb. 1. Over the weekend, the band tweeted teasers of the announcement with a 20-second video recap of their career as “Baba O’Riley” played in the background, and shared another short snippet of Wembley Stadium with a banner depicting The Who’s signature target bullseyes on either side. The news of the special performance comes on the heels of The Who announcing a 2019 North American, Moving On! tour, which kicks off on May 7 in Grand Rapids, Mich.